High quality and value NKJV super giant print reference Bible in charcoal grey imitation leather covers and easy thumb index access to every book of the Bible. Ideal NKJV for pulpit use or for enhanced readability at home or in church, this reference New King James Bible features 17-point printed text, two-column text setting, the words of Christ in red, a topical concordance, eight full-colour maps, and more. NKJV Super Giant Print Reference Bible Charcoal Imitation Leather Thumb Index by Holman Bible Staff, was published by Broadman and Holman in April 2019 and is our 25132nd best seller. 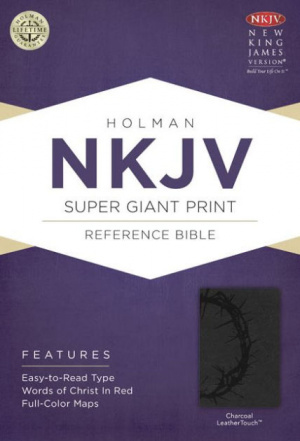 The ISBN for NKJV Super Giant Print Reference Bible Charcoal Imitation Leather Thumb Index is 9781433614101. Be the first to review NKJV Super Giant Print Reference Bible Charcoal Imitation Leather Thumb Index! Got a question? No problem! Just click here to ask us about NKJV Super Giant Print Reference Bible Charcoal Imitation Leather Thumb Index.